Having promised to take some pictures of the bus ages ago I've now finally got round to it. The bus is a plastic kit by Dornoplas and the mechanism is the Faller Road system bus (minus the bus body, of course, which is too long in its bought state). 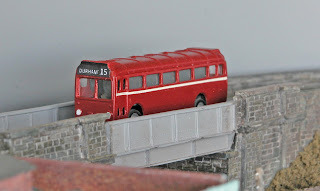 Above shows the United service 15 to Durham trundling accross the railway bridge at the Western end of Wansbeck Road. Road tansport sneaks in..........! The chassis had to be cut to shorten the wheelbase in order to get the body to fit it but if 2 mil modellers can't manage to do that we're not trying. I am not 100% happy with the destination blind which I did in word so I may re-think it and apply a new one. I also need to manufacture a coat of arms for the sides along with the words United Automobile Services. Maybe a railway company's insignia could do the trick as long as no-one takes close up pictures..................! However, the vehicle is only on view for a short time as it appears from behing the terraced rows and makes it's way across the bridge to disappear into the backscene behind a well placed building to mask it's exit from view. Those viewing the layout from directly in front have to 'cheat' to see where it goes. In reality many people do not detect the movement at all and sometimes it's arrival, oe indeed it's departure from the village, has to be timed to co-incide with a locomotive moving slowly beneath the bridge. Those who have seen it generally say the effect is pleasing. There are now plans to build a bus depot at the opposite end of the layout on the proposed Eastern extension. I like the model Mick; look forward to seeing it in operation. When did UAS start using just "United" on their buses? This being made up of a dropped capital "U" and underlined capital "NITED". Do you have a copy of the "United" book, Vol 2 covering postwar years? It looks to be a mine of information for the local bus modeller. I think some vehicles also had the 'D' dropped too. The prototype info came from a book loaned to me by Rod. I have my eyes peeled now for others that may be of interest since the road transport thing is taking off...!